If Tax Code and Invoice functionality are both enabled, the Tax Code fields for header and line item match invoices will default based on the referenced purchase order. 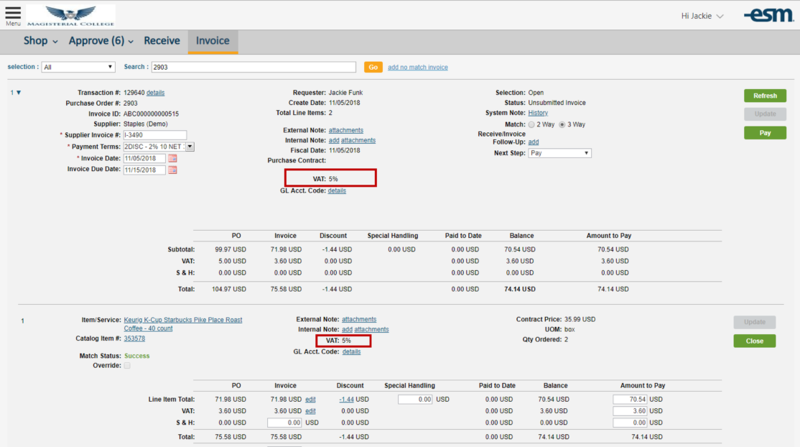 The tax amount will populate automatically after the invoice amount is specified. In Edit Entity Settings, a setting has been added to allow administrators to prevent changes to the Tax Code selections when creating invoices. The new setting, Edit Tax Codes – Invoice, defaults to Yes. When set to Yes, users can select other values from the Tax Code drop-downs as needed when processing invoices. When set to No, users cannot modify the Tax Code selection when processing invoices. 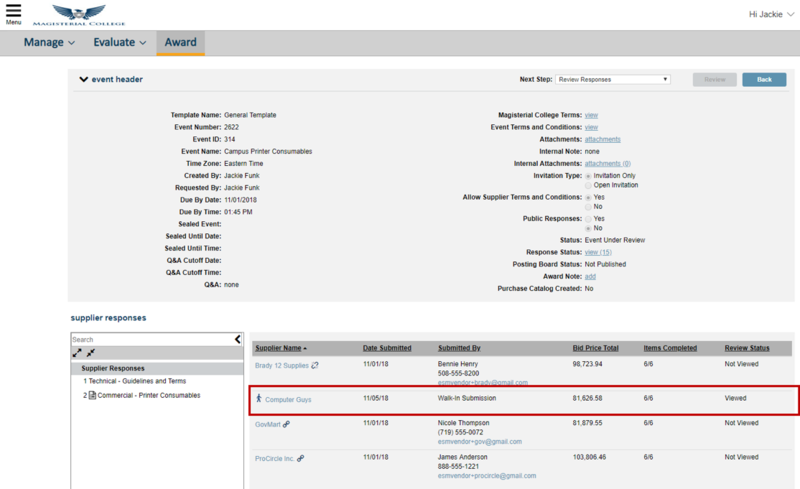 In order to support Invoice workflows requiring requester approval, a Requested By field has been added to the General Details section for Standing Orders. This drop-down will display all active Checkout users. The Order Type has been added to the Transaction Header Summary in the Approve and Manage tabs. In the new UI, the Approve Arrival Date will also display. If the Purchase application is enabled alongside Transaction to Sourcing functionality, an additional setting will display to allow administrators to determine the default Requested By for events initiated from Purchase. If set to Originating User, the transaction’s requester will default as the Requested By for transactions sent to the Sourcing application. This is the default setting. If set to Approver/Manager, the Manage tab user who sends the transaction to the Sourcing application will default as the Requested By. Walk-In Bid functionality allows Award users to enter event responses from suppliers who will not submit bids electronically. These responses can then be analyzed alongside electronic responses and awarded if desired. After selecting the Create Walk-In Response option from the Next Step drop-down, the screen will navigate to a supplier search. A supplier must exist as an active supplier in the Purchase application Non-Catalog Supplier database in order to create a Walk-In Response. After selecting a supplier record, the user can enter the supplier response detail for the event, including any attachments that may be required as part of the response. Once the response is submitted, it will show in the list of supplier responses with an icon to differentiate it from electronic responses.